Hanoi (VNA) – Vietnam’s total export earnings hit 17.5 billion USD in July, bringing the seven-month total to 115.2 billion USD, up 18.7 percent annually, according to the Ministry of Industry and Trade (MoIT). In particular, agro-forestry-fisheries remained a key currency earner. After a Memorandum of Understanding on rice trade was extended in late May by the Vietnamese Ministry of Industry and Trade and the Bangladeshi Food Ministry, rice export has kept growing, ending the prolonged decline. 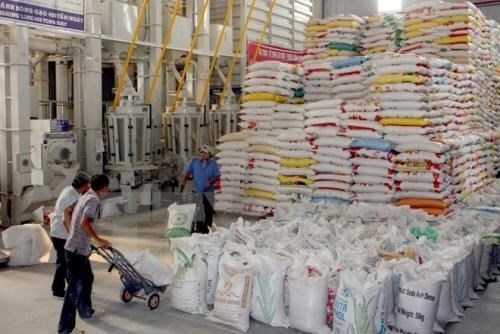 Accordingly, Vietnam shipped 465,000 tonnes of rice worth 201 million USD abroad in July, pushing the total rice exports in seven months to 3.3 million tonnes valued at 1.5 billion USD, up 15.7 percent and 13.7 percent in volume and value, respectively. The country recently won a bid to export 175,000 tonnes of rice to the Philippines, slightly raising the domestic rice prices in the south. Fuel, minerals and processing industry with key items such as coal, crude oil, petroleum, apparel, leather and footwear, computers and cell phones continued moderate growth of 18.1 – 39.4 percent. The US remained the largest exporter with seven-month value of 23.4 billion USD, up 9.9 percent year-on-year. It was followed by the European Union, China, ASEAN, Japan and the Republic of Korea. During the month, Vietnam spent 17.8 billion USD on imports, down 1.6 percent. On seven-month calculation, the total imports soared 24 percent to 118.3 billion USD. Therefore, its trade deficit reached 300 million USD in July and roughly 3.08 billion USD in seven months, or 2.7 percent of the total export. The MoIT forecast that the total export revenue will near 200 billion USD this year, marking a 13 percent increase annually. The total trade deficit will be about 5 billion USD, or 2.5 percent of the total export and lower than 3 percent set by the National Assembly. Imports will scale down between now and the year’s end due to massive disbursement for imports early this year.